"Four teams of university students have been selected to develop and conduct their hypergravity experiments during ESA's sixth 'Spin Your Thesis!' campaign, to be held 7-18 September 2015. The campaign will take place at the Large Diameter Centrifuge facility located at ESA's European Space Research and Technology Centre (ESTEC) in Noordwijk, the Netherlands. Two teams will use the centrifuge equipment during the first week, followed by the other teams during the second week." "PISCES announced this morning the two participating Hawaii high schools selected for the Moon RIDERS (Research Investigating Dust Expulsion Removal Systems) student lunar flight experiment during a dual-location press conference on Oahu and Hawaii Island. Kealakehe High School in Kailua-Kona and `Iolani School in Honolulu have been selected in the unprecedented STEM project partnering PISCES with NASA's Kennedy Space Center to involve students in a real-life lunar flight experiment that will be flown to the surface of the Moon. The press event included messages from Hawaii's Governor and U.S. congressional leaders, as well as presentations by NASA Swamp Works, educational leaders, and participating students." 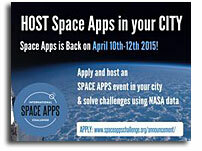 "NASA and other space agencies around the world are preparing for the next International Space Apps Challenge. The International Space Apps Challenge is an international mass collaboration that takes place in cities around the world. The event embraces collaborative problem solving with a goal of producing relevant open-source solutions to advance space exploration missions and improve life on Earth. NASA is leading this global collaboration along with a number of additional government collaborators and local partner organizations." "Thousands of extrasolar planets have been discovered, and it is clear that the galactic planetary census draws on a diversity greatly exceeding that exhibited by the solar system's planets. We review significant landmarks in the chronology of extrasolar planet detection, and we give an overview of the varied observational techniques that are brought to bear. We then discuss the properties of the currently known distribution, using the mass-period diagram as a guide to delineating hot Jupiters, eccentric giant planets, and a third, highly populous, category that we term "ungiants", planets having masses less than 30 Earth masses and orbital periods less than 100 days. We then move to a discussion of the bulk compositions of the extrasolar planets." "We develop a method to enable collaborative modelling of gravitational lenses and lens candidates, that could be used by non-professional lens enthusiasts. It uses an existing free-form modelling program (glass), but enables the input to this code to be provided in a novel way, via a user-generated diagram that is essentially a sketch of an arrival-time surface. We report on an implementation of this method, SpaghettiLens, which has been tested in a modelling challenge using 29 simulated lenses drawn from a larger set created for the Space Warps citizen science strong lens search. We find that volunteers from this online community asserted the image parities and time ordering consistently in some lenses, but made errors in other lenses depending on the image morphology." "At NASA, we are excited to announce the roll-out of the Physical Science Informatics (PSI) data repository for physical science experiments performed on the International Space Station (ISS). The PSI system is now accessible and open to the public. This will be a resource for researchers to data mine the PSI system and expand upon the valuable research performed on the ISS using it as a research tool to further science, while also fulfilling the President's Open Data Policy."